Please note, this product is splash resistant only, and is not designed to be submerged in water. It is not water proof and this does not constitute as a claim to safe guard your phone from water contact. iCoverLover takes no responsibility for any water damage to your phone. You may continue using your smartphone as per normal, whilst shielding from minor water splashes at the beach, sand and dust. Express Post and International postage options also available at check out. This product comes free with every case sold. 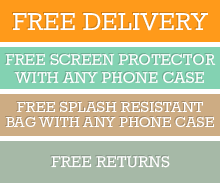 Click the button below to add the Splash Resistant Smartphone Bag to your wish list.